From ballet to dress up, there are several reasons why girls or women may want a tutu. 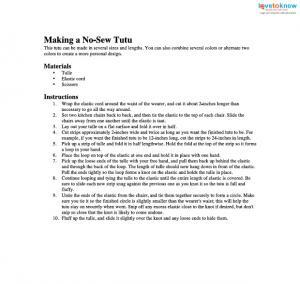 Since tulle can be tricky to sew properly, a no-sew version can be invaluable, particularly if you need to make several. Children may also be able to make their own, with or without a little help. 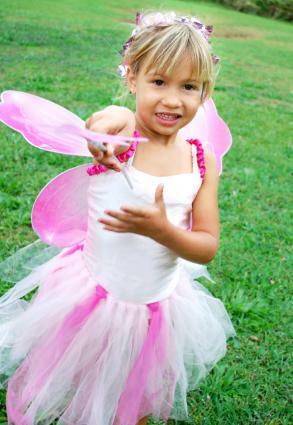 Try this no-sew tutu design to create as many as you need. This tutu can be made in several sizes and lengths. You can also combine several colors or alternate two colors to create a more personal design. Wrap the elastic cord around the waist of the wearer, and cut it about 2-inches longer than necessary to go all the way around. Set two kitchen chairs back to back, and then tie the elastic to the top of each chair. Slide the chairs away from one another until the elastic is taut. Lay out your tulle on a flat surface and fold it over in half. Cut strips approximately 2-inches wide and twice as long as you want the finished tutu to be. For example, if you want the finished tutu to be 12-inches long, cut the strips to 24-inches in length. Pick up a strip of tulle and fold it in half lengthwise. Hold the fold at the top of the strip so it forms a loop in your hand. Place the loop on top of the elastic at one end and hold it in place with one hand. Pick up the loose ends of the tulle with your free hand, and pull them back up behind the elastic and through the back of the loop. The length of tulle should now hang down in front of the elastic. Pull the ends tightly so the loop forms a knot on the elastic and holds the tulle in place. Continue looping and tying the tulle to the elastic until the entire length of elastic is covered. Be sure to slide each new strip snug against the previous one as you knot it so the tutu is full and fluffy. Untie the ends of the elastic from the chairs, and tie them together securely to form a circle. Make sure you tie it so the finished circle is slightly smaller than the wearer's waist; this will help the tutu stay on securely when worn. Snip off any excess elastic close to the knot if desired, but don't snip so close that the knot is likely to come undone. Fluff up the tulle, and slide it slightly over the knot and any loose ends to hide them. Alternate two colors of tulle along the elastic. For example, tie on a strip of color A, and then tie on a strip of color B. Repeat until the elastic is fully covered. Make color "blocks" by using a single color for about six strips, and then switch to another color. Alternate the lengths of tulle, making every other strip longer to create a more bohemian effect. Tie a second, shorter layer of tulle strips on top of the first to create a multi-dimensional tutu. Tie long lengths of satin ribbon to the elastic mixed in with the tulle to add some depth to the finished design. This method of tutu making is so fast and easy that you'll be able to make a few tutus in under an hour. Make them for children's birthdays, costume parties, or anytime at all, and create some tutu fun.